A tall-growing perennial hardy in USDA zones 5 through 10, red hot poker (Kniphofia uvaria) produces a large number of flowers on each plant. It makes an excellent cut flower that lasts a week or longer in a bouquet. Birds, bees and butterflies find this plant attractive, and it makes an excellent addition to a garden designed to attract these flying pollinators. Red hot poker is an upright-growing, clump-forming perennial that reaches 4 feet or more high under ideal conditions. Sword-shaped leaves grow from a basal tuft. The flower stalks emerge in early summer sans blossoms, which develop at the terminal ends. They form a raceme of drooping, tubular flowers that open from the bottom up. Intolerant of wet, heavy soils, especially in winter, red hot poker prefers full sun with well-drained, dry to medium-dry soil. 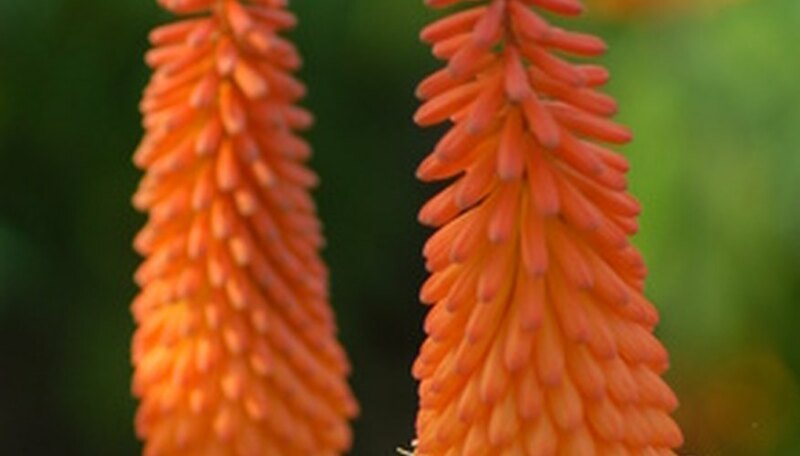 Plant red hot poker in the back of the perennial border or mass it together in groups of three as a feature in the landscape. Species varieties of red hot poker have flowers in red, orange, coral or combinations. The named cultivar 'Prince Igor' has yellow flowers and grows 80 inches high. 'Minister Verschuur' also produces yellow flowers on smaller plants that grow just 40 inches high. Plant red poker rhizomes 4 inches deep in early spring when temperatures are reliably in the upper 40s. Rarely needing supplemental irrigation or fertilization, red hot pokers are hardy down to 14 degrees F. Dig the rhizomes at season's end, and store them moist at a temperature of 35 degrees F. In areas where winter temperatures reliably stay above 14 degrees F, mulch heavily in late fall when the foliage dies down. Red hot poker is seldom bothered by pests or diseases.